The trade fair Heavent Paris for events, exhibitions, seminars and conferences takes place in Paris since 2000. A few years later, Heavent Meetings in Cannes was born. The organizer for both fairs is Romuald Gadrat. Innovative dynamism, creative presentations, informative conferences, thoughtful preparation, very targeted get-together, significant knowledge, remarkable exhibitors, expert trade visitors and last but not least top locations characterize the fairs and make them “the places to be”. 450 exhibitors, 20.000 square meters, 17.965 visitors – Heavent Paris is one of the major European trade fairs growing continuously. In the evening Heavent Paris becomes Heavent Palace with hype music, exceptional animation and constructive networking. Today’s objective: Associating European exhibitors and visitors with this successful concept. Thus, they can develop new and productive contacts during this leading trade fair. Heavent Meetings is an Event and MICE trade fair (400 exhibitors) with targeted and individual appointments, business lunches and three networking-evenings in amazing event locations. 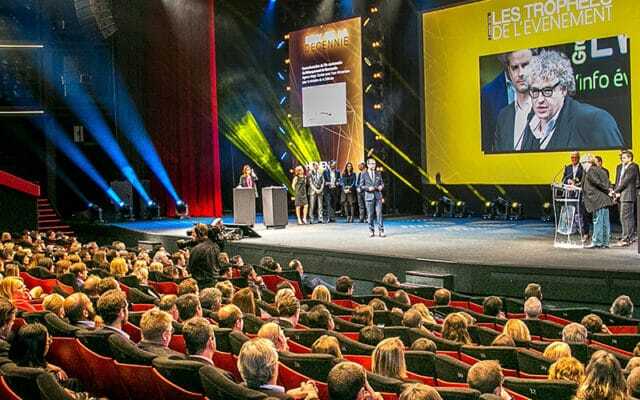 And of course, the ceremony of the international “Heavent Awards” taking place in the legendary Palais des Festivals de Cannes. With 2.500 trade visitors, 500 of them Hosted Buyers (agencies and corporates), Heavent Meetings is the focused meeting place for trade professionals. The Heavent Meetings hosted buyer program for European event decision-makers (agencies, associations, corporate) includes travel to and from Cannes, accommodation in a top hotel in Cannes, Lunch & Dinner. The exhibitors of the two trade fairs are providers of event technology and production, local event agencies, hotels, destinations, congress centers, performances & entertainment agencies, furniture hire & decoration, catering, Event software & technology, tents & structures.